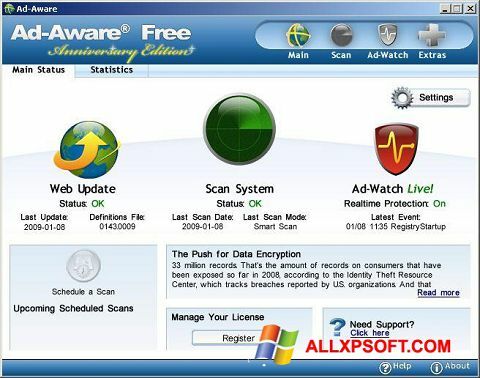 Ad-Aware Free for Windows XP - anti-virus product for comprehensive protection of your computer. The application uses several real-time scanning methods, contains an updated signature database, a download manager, a tool for monitoring application launch and network utilization. The utility allows you to find and remove various spyware, installed rootkits and advertising extensions, includes a module on the definition of phishing sites. The program has a game activity mode, an intuitive interface with the ability to display notifications and plug-ins for common browsers. You can free download Ad-Aware Free official latest version for Windows XP in English.